This toasty parmesan chickpea salad is my new favorite side dish. It is absolutely delicious! It has a nice crunch from the green peppers, red onion, and bacon that has been sizzled in salty bacon drippings. It is sprinkled with freshly grated Parmesan cheese that holds everything together like glue. 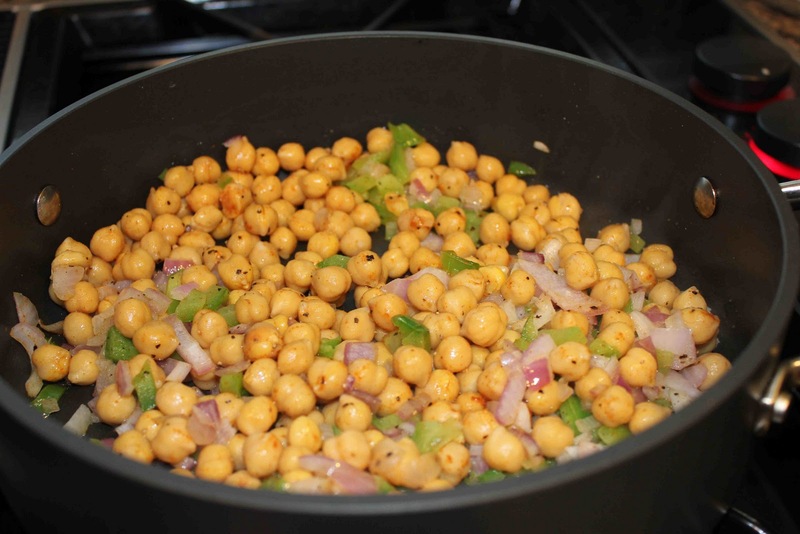 With a pleasing flavor, my husband even enjoyed this… and I’m not sure he’s even eaten chickpeas before! In terms of nutrition, the health benefits of chickpeas are numerous. Chickpeas, also known as garbanzo beans are high in protein and fiber. They also are a healthy source of carbohydrates for people with insulin sensitivity or diabetes. Chickpeas are low in fat, have a healthful source of zinc and folate, and also assist in lowering cholesterol in the bloodstream! Give these a try and let me know what you think! 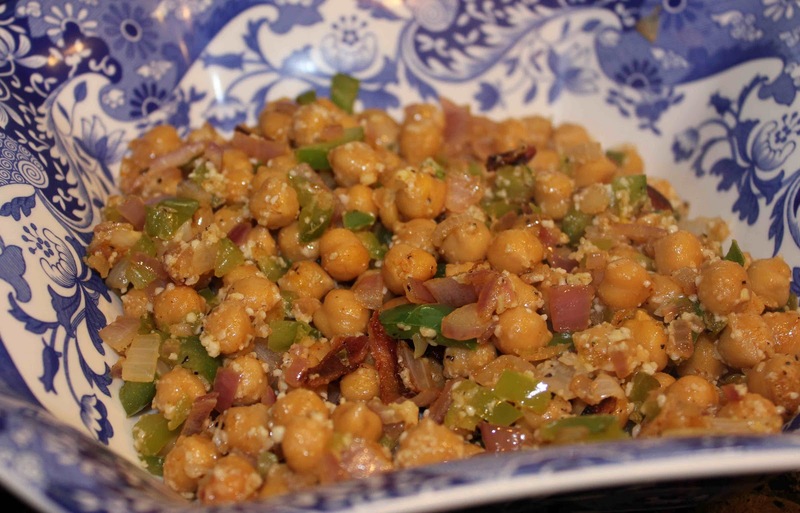 From now on, I will always have a can of chickpeas in my pantry to make this savory salad. Let me know what you think! Enjoy! After roasting chickpeas, saute onions and peppers for 2 minutes. Add chickpeas, toast for another 5-7 minutes. Add bacon, Parmesan and parsley. Serve immediately. 1. Heat a skillet on medium heat. Add bacon and fry until golden. Remove with a slotted spoon and drain on a paper towel, leaving grease in the skillet. 2. Add onions and green peppers to the bacon fat, and cook for 2 minutes. 3. Make sure chickpeas are dry and toss with paprika and pepper. 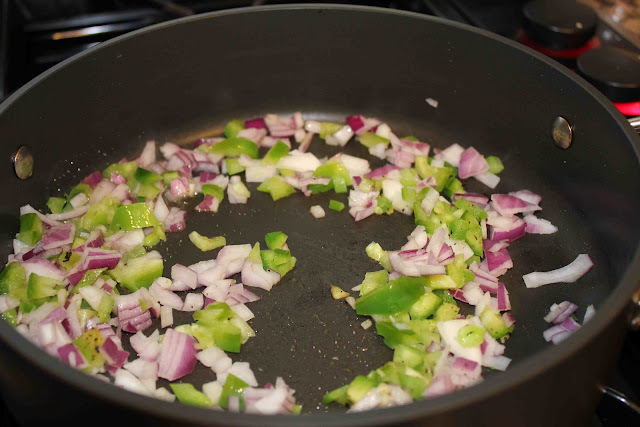 Add to onions and peppers, stirring and toasting for 5-7 minutes. Add garlic and cook for one minute. 4. Turn off heat and add Parmesan cheese and parsley. Sprinkle on bacon. Serve immediately.